A 41-year-old male patient presented with a chief complaint of discomfort in the flanks for the last 2 months. The pain was intermittent and undiffused, and there was no relief on taking rest. Up to this presentation, the patient has been healthy with no related symptoms. The patient was hospitalized for further diagnosis and treatment. It was found that the routine examination and tumor markers were within the normal range. On magnetic resonance imaging (MRI), a lesion was observed in front of the psoas major muscle. This lesion could be a mesenchymal tumor or neurogenic tumor. Furthermore, computerized tomography identified a right retroperitoneal space that occupied the lesion, which was approximately 5.6 × 5.1 × 8.7 cm in size. Based on the preoperative medical history, physical signs and auxiliary examination, it was diagnosed as a case of posterior peritoneal space-occupying lesion. However, the nature of the tumor needed to be confirmed by pathological examination after resection. Thus, a retroperitoneal mass resection was planned. After careful separation in front of the tumor, it was observed that the tumor lifted the right ureter, and the right ureter continued to move downward, entering the tumor from the middle of the tumor and passing out from the bottom of the tumor. 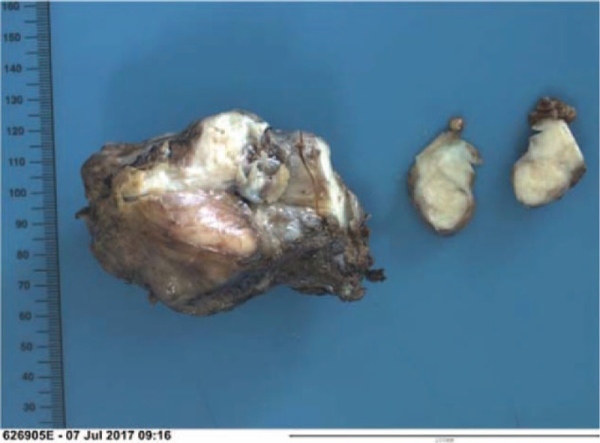 Since the tumor was severely adhered to the right kidney, the right ureter left a crevasse of approximately 0.3 cm when this was moved away from the tumor. However, considering that the resection of the tumor might have affected the ureteral stent implantation, the gauze was used to isolate this as the operator continued the separation. There was a gap between the tumor and blood vessels, such as the inferior vena cava, without obvious adhesion. After completely separating the tumor from the inferior vena cava and right iliac artery, the posterior wall of the tumor and psoas muscle could be closely observed. Then, the tumor was completely removed. Next, the urology surgeon performed ureteral stent implantation, and no leakage of urine or bleeding was found in the right ureter. 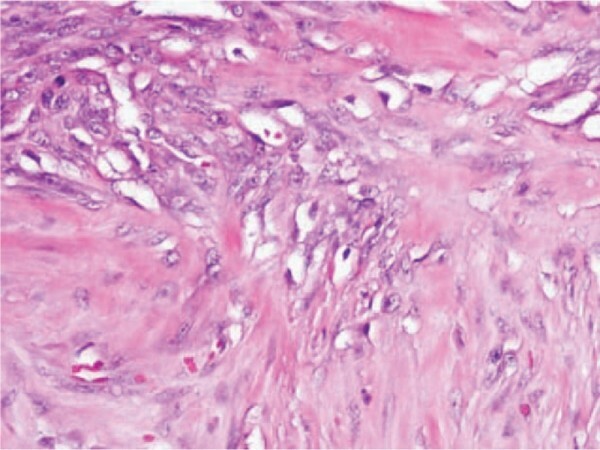 The tumor had a lobular mass of approximately 8.2 × 5.5 × 4.2 cm. On the surface of the mass, there was a suspicious bone tissue of approximately 2.0 × 1.5 × 0.9 cm. Postoperative pathological (Fig. 3) evaluation revealed that it was a hardening type atypical lipomatous tumor/well-differentiated liposarcoma, with extensive ossification. There was no metastatic invasion in the vessels, nerves, and surrounding lymph nodes. The immunohistochemical results revealed the following: CD34(–); CD99(±); Desmin(–); SMA(part+); ki-67(5%+); STAT6(+); Bcl-2(–), CD117(–); Dog-1(–); S-100(diffusion+). CD34, SMA, Desmin, CD99, S-100 protein, and Ki-67 (cell proliferation markers) are often used in the diagnosis of soft tissue tumors. S-100 protein has a positive expression in well-differentiated and mucinous PRPLS, but has a negative expression in undifferentiated and polymorphous/mixed PRPLS. STAT6 has a positive expression in isolated fibrous tumors. K-67 is a recognized nuclear antigen that is specifically correlated to cell proliferation, and is mainly used to determine cell proliferation activity. The clinical diagnosis of PRPLS was established. Then, the patient was discharged from the hospital after a week (July 14, 2017). There was no report of relapse on the follow-up survey after 6 months and after 1 year.